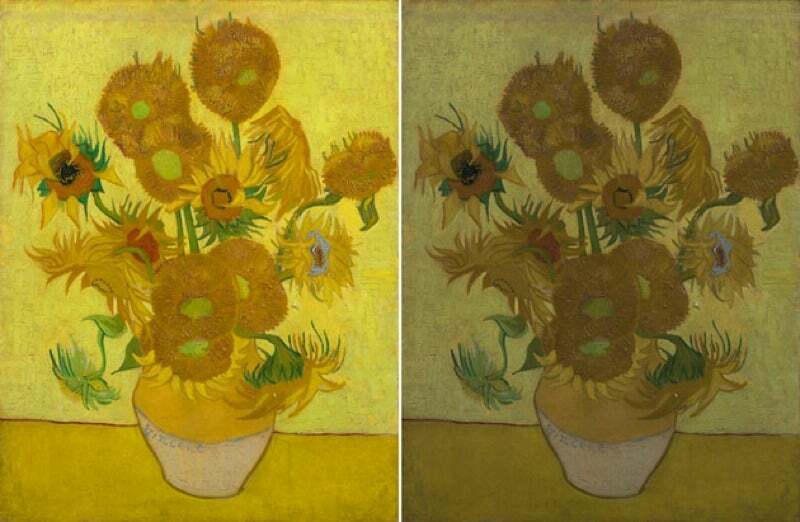 The vibrant colours of many of Vincent van Gogh's most famous paintings — including his Sunflower series — have been fading over the last 100 years. Now a team of Italian scientists has come up with an explanation as to why the lead chromate dyes favoured by the artist when mixing his pigments degrade so much under light. They described their work in a new paper in Chemical Science. Other canvases from the same period (for example works by Renoir) are also prone to fading, but Van Gogh's paintings are especially vulnerable. That's just one reason why his work is proving to be a particularly rich resource for scientists interested in studying how certain fragile pigments degrade over time. Not only was he incredibly prolific — producing close to 1000 paintings in just ten years — but he was obsessed with pigments, describing his favourites and how he used them when mixing paints for his canvases in letters to friends and family. So there's an extensive historical written record of his practices. Sometimes it turns into plattnerite or galena, blackening the colour, and other times it might convert to red lead or lead sulfite, bleaching it out. [They]... discovered a very rare mineral called plumbonacrite in the van Gogh canvas that seems to play a role in the bleaching process of the pigment. Over time, light triggers CO2 absorption, which causes plumbonacrite to form, eventually turning into white-hued lead carbonate. The same team was also behind a 2011 study of the yellow pigment the artist favoured. Chrome yellow was the new hotness among late 19th century artists, so it was a natural choice for van Gogh, who loved strong vibrant colours. 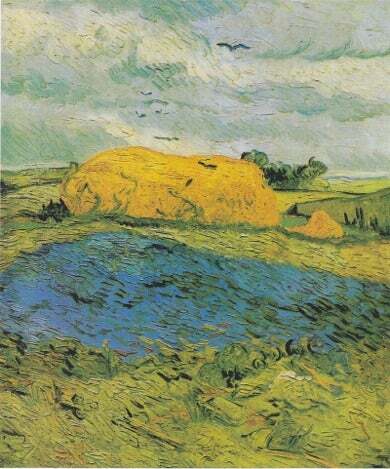 Van Gogh's "Wheat Stack Under a Clouded Sky." Courtesy of the Van Gogh Museum, Amsterdam. Public domain. But exposure to strong sunlight makes the colour change from bright yellow to a dull brown. Janssens suggested that the chromium in the pigment reacted particularly strongly with compounds like barium and sulphur. It just so happens that barium and sulphur were key ingredients in the white paints common in van Gogh's time — and the artist often blended his yellows with whites, thereby brightening his colours. Two of the paintings they studied contained barium sulphate, likely used to make the paint go further, according to Janssens. Still, the precise reasons why this would make the dyes so unstable remained unclear. That's where Ana Munoz-Garcia and his colleagues at the University of Naples Federico II come in. They modelled the chemical structure of the dyes to figure out if the fading is just something happening at the surface, or whether it's an innate structural issue. The bad news: it's the latter, which means there's very little art conservationists can do for now about the fading, apart from limiting the paintings' exposure to sunlight. "Pure sulfate is the bad guy of the story," Munoz-Carcia told Chemistry World. "All the sulfates want to be together to minimise stress in the material. So because of the segregation, you generate that sulfate. And because the sulfate absorbs in the UV, you get degradation." Bright yellow chromium turns into a dull green. How does Janssesns feel about this latest study? 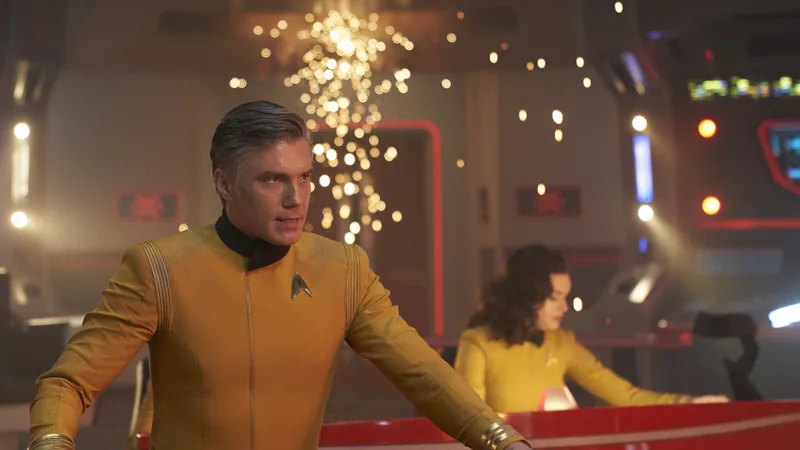 He's understandably cautious, particularly since these are theoretical predictions based on computer simulations. "We have some experimental data on this and can now confront their predictions with reality," he told Chemistry World. "A more systematic verification is now very useful to do."